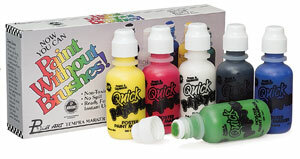 These self-dispensing, refillable markers are great for pre-school, elementary, and special education students. Colors spread in wide strokes with no dipping, no spilling, and no clean-up. ® Rich Art is a registered trademark.™ Quick Painter is a trademark.